It seems to me to be all about contrasts since I returned from the UK. Living in Crete is so much less hectic and more peaceful compared with the sheer volume of people, traffic, shops and buildings that I have recently experienced during my stay in the UK. I notice this every year and I have come home again to Crete with a smug feeling of relief and real freedom. The contrast in the weather has been quite amazing really. 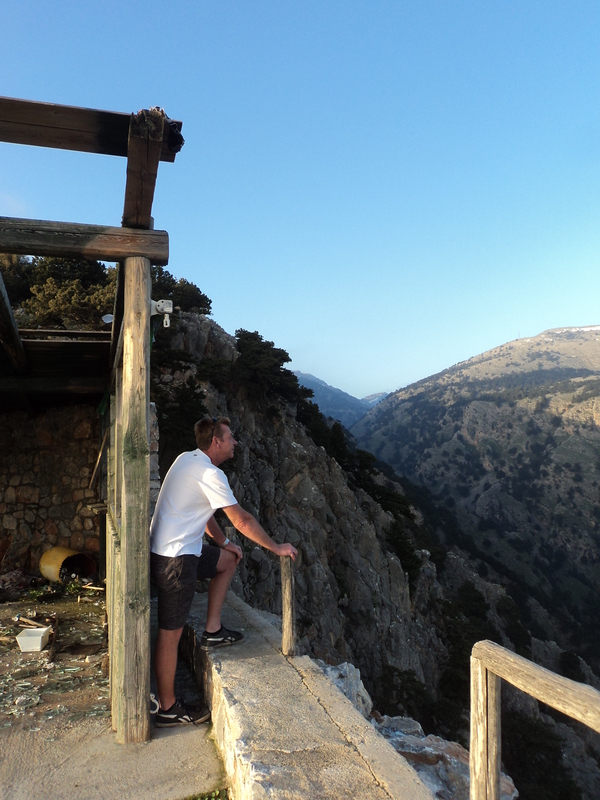 When I first arrived back on Cretan soil I was delayed a night because of the snow blizzards. It was cold and the temperature in my apartment was at the lowest it’s ever been – at twelve degrees. So already I know it’s a colder winter than last year. I cannot afford the luxury of centrally heating my large open-plan living space because the fuel (which is really crude petrol), is usually so expensive, although prices have dropped quite dramatically in recent months. I would have to run the central heating almost 24/7 to keep the apartment warm as all the houses here are not insulated and not really designed for winter living. Consequently, I make do with my calor gas heater, always next to me as I work and then relax on my sofa in the evenings. I am fully layered up with clothes during the day, which are always pre-heated and I wouldn’t be without my electric blanket! Over the years I have become used to this routine for keeping warm and although it’s not ideal there are some benefits. I am breathing much fresher air and therefore generally get less colds or viruses. 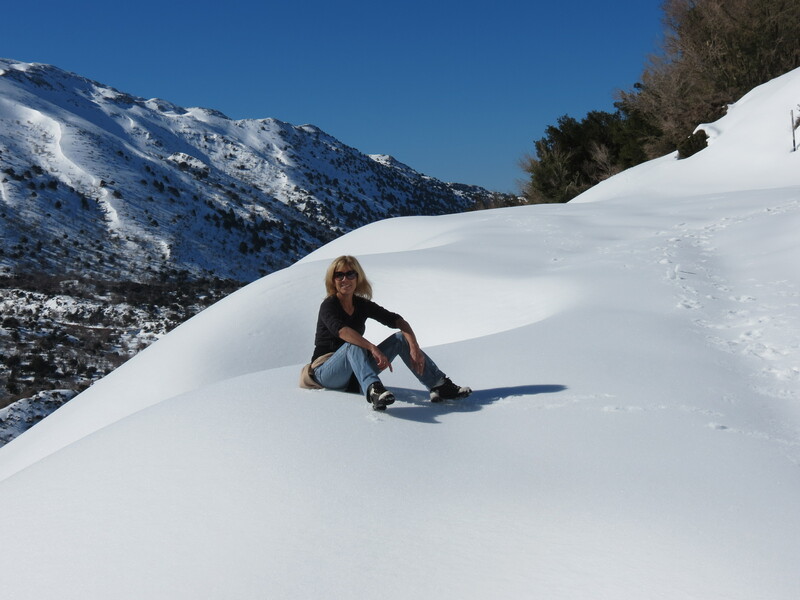 Yet all this past week we have had temperatures of twenty degrees and over, true blue skies and no winds and it was on such a day that I went walking in the snowy mountains! On the way to Omalaos – the beautiful snowy scenery! Ian invited me and I was delighted because I have only ever walked in the mountains in the Spring/Autumn when it is still quite warm. To actually be going up so high in all that snow was just too good an opportunity to miss! Ian is an experienced climber/walker and knows the mountains well. We drove up this particular mountain to Omalos in four wheel drive mode because the compacted ice on the roads would have been quite treacherous without it. Omalos is actually the official entrance to Samaria Gorge although I didn’t recognise it at first. There was so much snow up there that the ticket huts were buried almost to their roof tops! I couldn’t believe the sheer volume of the snow. There were huge drifts everywhere you looked and they were so compacted and slippy in parts that we couldn’t access some of the routes Ian had originally wanted us to take. Nevertheless, we found a reasonably flat stretch gradually upwards and couldn’t stop taking photos of all the amazing views we encountered along the way! It was fabulously beautiful! Sitting on top of the snowy mountain in the warm sunshine! By the time we had walked back down to the entrance for Samaria Gorge we were ravenous, having only munched on bananas and snacks. Although we’d both brought sandwiches with us, we ended up having lunch in a traditional taverna there. It had a large open log fire but we weren’t really in need of it because the sun reflecting off all the snow made it actually quite warm up there and so I was stripping off layers as we walked.What a brilliant day it turned out to be all round, because the day before, Nick called me to say he could get a cheap flight out and so I picked him up from Chania Airport that evening after I’d been walking in the mountains! Consequently… I have had an unexpected sort of holiday! Nick and I love going out for the day, visiting different places and of course I love exploring the deserted beaches – as I need to do during the winter anyway. We collected heaps of seashells that I need for my artworks. With the weather so glorious we just couldn’t waste it and during the six days Nick was here we had four beach days – how cool is that in January?! With temperatures of over twenty degrees, we were wearing shorts and t-shirts most of the time. It was just like being on holiday but without all the tourists, so that we had the beaches to ourselves and sometimes had to struggle to find a taverna that was open. 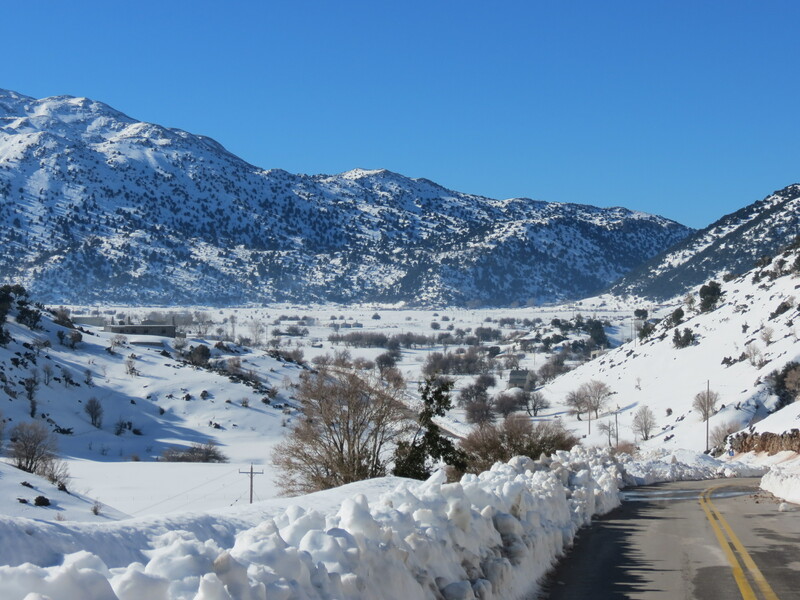 But that’s what we love about the winters in Crete! And what an amazing contrast – to have been walking in deep snow in the mountains one day and then soaking up the sun on a warm sandy beach the next! On Thursday Nick and I decided we’d spend the day in Chania. We walked the full length of the large harbour front and ended up visiting the Maritime Museum at the end of it. I have wanted to visit this museum for the last few years but just hadn’t got around to it. There is a large seashell room and it was fascinating for me to recognise all the local shells I had found here on Crete and also to realise that there were only about two or three types that I have yet to discover. After the museum we continued our walking for about fifteen minutes along the coastline until we reached the quaint little bay and harbour at Nea Chora. Here we checked for seashells and then found a comfy spot leaning against a huge tree trunk that must have washed up on the beach during a previous storm. Later we walked back to Chania Harbour and found a lovely spot right on the edge of the harbour at which to stop for a snack and a couple of beers. In fact we stayed here for a couple of hours, soaking up the sunshine and enjoying the comings and goings of all the locals. When the sun had gone down and we started thinking about dinner, we were both really in the mood for a Chinese! We knew of a couple of Chinese restaurants in the centre of Chania but it turned out that they were both closed and so I can only assume that the Greeks don’t like Chinese food and that these restaurants are only open for the tourists through the summer season. How annoying when you fancy something different to eat for a change! I know you wouldn’t have the same problem in the UK but hey – you can’t have everything and I can definitely live with this one small disappointment! We finally ate dinner at a fish restaurant further down the other end of the harbour and that was fine because we’d had yet another full and wonderful day out with sunshine all day long. 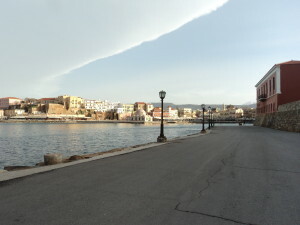 The other side of Chania Harbour Front, with the Maritime Museum on the right. So yesterday Nick caught the early flight back to Athens to connect for his flight back to the UK and I have resumed work on my seashell mosaics and collages, continuing to build up my stock for the coming summer season again. I still can’t help thinking how wonderfully 2015 has started and how much I am still loving living and working on the beautiful island of Crete! This entry was posted in Blog Posts and tagged Chania, FrangoKastello, Omalos, Seashell Mosaics by micmaryjo. Bookmark the permalink.